The College of Architecture & Environmental Design (CAED) Ambassadors are a team of enthusiastic students who promote the college and actively participate in its interdisciplinary activities. The purpose of the ambassadors is to serve as student representatives for college functions and to promote the CAED to prospective students, alumni and industry representatives. Ambassadors participate in events such as Parents & Alumni Weekend, Open House, Commencement and class reunions. In addition, they serve campus visitors by providing tours of the support facilities that the college has to offer. Meetings: Dexter Building, Bldg. 34, Room 159A, bi-weekly on Tuesdays at 11 a.m.
New member candidates are invited to submit an application with a letter of reference. Students chosen to participate as ambassadors will enjoy opportunities to enhance their leadership, interpersonal and public speaking skills while gaining invaluable knowledge about the university and college by working with the Dean's Office and all of the individual departments. Applicants who meet the screening requirements as a result of the application submission will be invited to an interview. Get to know a little bit about your College of Architecture and Environmental Design Ambassadors! If you have a general question you'd like to ask the ambassadors, please email: caedamb@gmail.com. If you would like to get in contact with a specific ambassador, just enter the ambassadors name in the email subject! 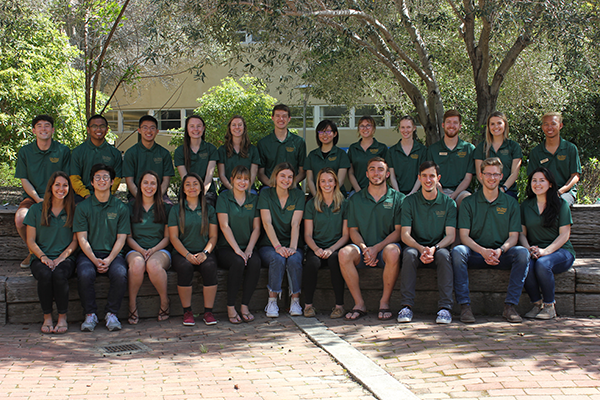 To contact the ambassadors' advisor, email the CAED Special Projects Coordinator Ray Ladd at rladd@calpoly.edu or call 805-756-7432.